Stranded in the Fukushima Evacuation Area | Web comic "Surfer Joe"
I was heading home from the Christian Surfers Japan conference in Chiba when I stopped at a konbini to pick up some supplies for the road. As I was about to leave a fisherman came up to me and gave me a styrofoam tray loaded with fresh catch fish. I told him I was headed to Sendai and I was worried they wouldn’t keep. He told me not to worry about it and take the fish. Money has been a little tight for us so I accepted the fish with gratitude and went on my way. Google maps tell me that taking the Joban expressway along the east coastline is the fastest route so I decide to give it a try. I’ve never driven it before, but it bypasses the Tokyo area so it seems like a solid option. My phone battery is hovering around 6% and the charger in my car only works when it feels like it. So as soon as I hit the freeway I shut Google maps down and let the phone charge as I drive in silence. As my mind wanders while I drive I keep thinking about the fish the man had given me. I’m worried they won’t survive the trip to Sendai, so I turn the air conditioning on and place them on the floor of the passenger seat. Entering Fukushima I have about a 3rd of a tank of gas left. I see a sign for a rest stop that has a service station, but I figure I’m good until the next one. What I didn’t know was I was about to enter the evacuation area, and that there wasn’t another rest stop with gas until the other side. Every few kilometers there are signs showing radiation readings. The first sign reads 0.3 usv/h which seems fine to me. But I know next to nothing about radiation readings. The numbers keep climbing, and my gas keeps getting lower. I’m starting to get nervous. Being stranded in a nuclear evacuation zone where there’re no people with a phone low on juice(at night, no less) is not my idea of a relaxing Sunday evening. I’m down to my last tick of gas. I shut the air conditioning off and curse myself for not doing it sooner. “Screw the fish”, I thought. The last radiation sign read 3.7 usv/h, which is much scarier to the uneducated like me. I spot another sign for a rest area with a gas station. 53 km away… I do the math, it’s about a half hour of driving. It’s going to be close. I don’t want to get stuck on the freeway so I prepare for the possibility of taking an exit and searching for gas. The gas light turns on and the meter starts flashing. I’m nowhere near the rest area. I decide to take my chances on the nearest exit. A town called Namie. There’s no one working the toll booth, just an automated system. I take the turn into town and drive slow and look for a station. It’s a ghost town, houses overgrown with vines. Some with collapsed roofs. Out of the corner of my eye I see a man walking into one of the houses. There are a few cars and I follow where they are coming from. I see a gas station in the distance but the lights are out. The car is starting to sputter a bit so I decide to check it out. It’s closed. There is an abandoned truck and a motorcycle laying on its side. The grass is growing through the cracks in the pavement. Having no idea where I am I decide to go back to the house and see if the man can help me. I start heading back. The first thing I notice when I pull into the driveway are all the dogs hanging around. I see two in dog houses by the front door of the house. Next to the house is a smaller wing that looks like either a barber shop or an animal clinic. A group of Shiba kens are on the stoop. There must be four or five of them. I get out of the car and the dogs by the house start barking. It makes me nervous not because they’re alerted to my presence as much as no one comes out to greet me. I see a person moving around in the annex, so I head over in that direction. The dogs keep barking at me. The Shiba kens barely acknowledge me as I arrive at the door. They seem pretty bored. I say “hi” to the closest one and he just kinda looks at me. A few cats from inside come over to greet me. I don’t want to open the door for fear of letting them out, so I knock. There is no answer so I knock again, louder this time. I think I hear someone answer, but the dogs by the house are still barking and it’s hard to make out. So I crack the door and wedge my leg in the door to keep the cats from making a break for it, though they don’t seem interested in escaping. A warm breeze from inside hits me. It smells like a pet store. “Gomen-kuda sai,” I say. My Japanese is a little sloppy but I’m pretty sure this is the phrase to use when intruding on someone’s home. “Hai.” I hear a lady say. A stocky woman comes to the door. She’s sweaty and has a hand towel draped over her neck. She pulls up and end and wipes her brow with it. Her eyes are big and gentle and give her a childlike quality. If I were to guess I’d say she is in her 50’s, but she looks younger. She seems busy and I don’t want to waste time so I get right to the point. She tells me that there are a couple of gas stations in town but because it’s Sunday they’re probably closed for the evening. We go outside to find her husband. He is a smaller man with a deep tan and full head of hair. He tells me the same thing as his wife did, and scolds me a bit for not getting gas when I should have. I can’t argue so I take my medicine. I get the feeling that these two are very busy, and I have inconvenienced them. One can only imagine what a day in the life is like here. “Is the gas light on?”, He asks. “Yeah”, I say. He decides it’s worth a shot to grab a gas can and drive into town to try and find gas, and I am grateful for the effort. I stay behind and after he leaves we stand around awkwardly for a moment before curiosity gets the better of me. She says no, but that they were taking care of the pets that were left behind when Namie was evacuated. She tells me about how the vets in town dropped off their patients for them to look after. And she invites me inside. The inside of the annex is crawling with cats. There are cages stacked on cages, and they’re all full up. There must be half-dozen cats roaming around freely. In the middle of the room, there is a fish tank with a couple of decent size goldfish swimming around. There are a couple of leather couches in the corner that has been torn to shreds by kitten claws. In between the couches is a television playing some old Japanese cop show. I take a seat on one of the couches and ponder my situation a bit. A cat hobbles up and snuggles next to me. She seems healthy, her eyes are bright and her fur is clean and beautiful. All the cats seem happy and well taken care of. Some of them have defects and scars, though. A cat walks by with a cloudy eye, and the one snuggling me is missing a paw. The fish look a bit worse, one of them is pretty discolored and seem to be shedding scales. But even they are full or energy. I recall the dogs outside and how healthy they looked. I could tell this couple loved the animals, and my admiration for my hosts grew even more. On paper, the situation I’m in may seem frightening. Stranded in Fukushima near the nuclear plant with no gas and a phone that is about to die. The likelihood of finding gas tonight was slim. I think about the worst case scenario. 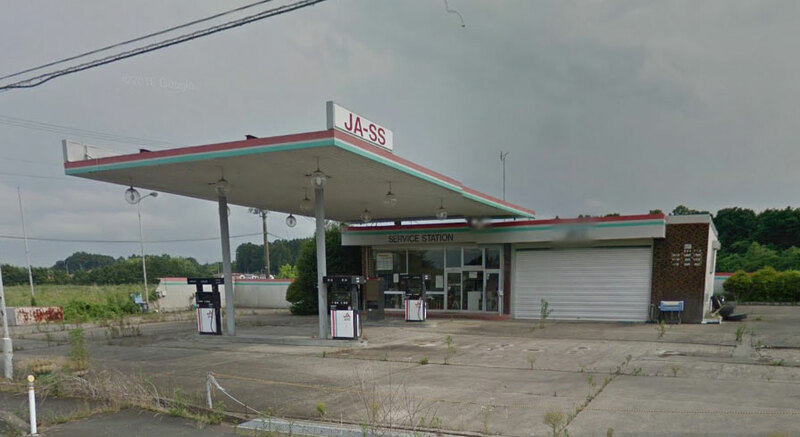 I’d have to stay the night here and go get gas in the morning when the station in town opens. Radiation has a scary reputation, but if these people can live here with all these animals then surely I can survive a night here if I need to. Now that I’m calm it’s time to call the wife and let her know what’s up. “Hello?”, she answers. I decide to wait to see if the husband comes back with gas before I call the insurance company. I’m not sure how long it will take so I decide to strike a conversation with the wife. There’re a few posters of Romance of the Three Kingdoms on the wall. 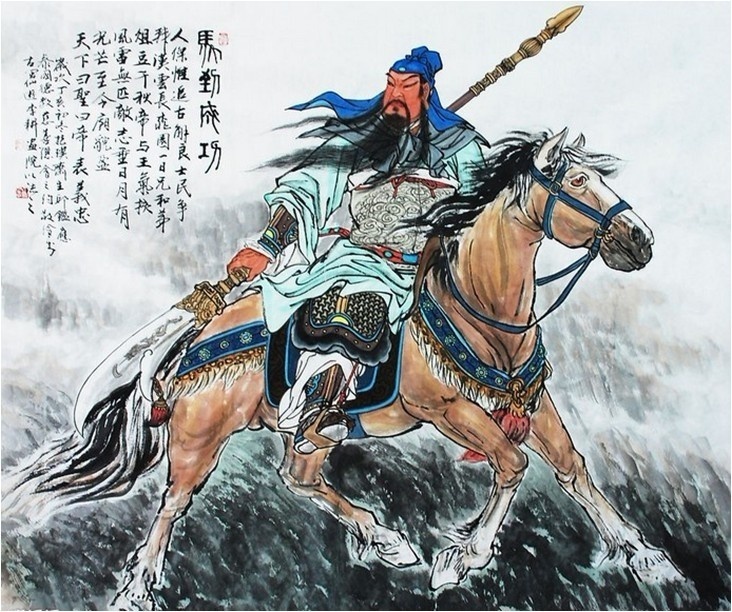 I recognize Guan-Yu straight away. I ask the lady about it and she lights up a bit. She says they’re fans of the old show, and that their sons play the video game. I ask her how long they’ve been here and she tells me since the spring. She talks about how a lot of the neighbors left their pets behind. The neighborhood vet dropped off a few dogs and cats with them when he left, including two Siberian Huskies. We shared our experiences with the 2011 earthquake and the tsunami that followed. She told me how they hid while everyone else was evacuating, and how they watched the Japan Self Defence Force come in with their hazmat suits on. I asked how far away from the Daiichi Nuclear Power Plant we were and if we were in any danger. She said we were about 30 kilometers(15mi) and that the area has been re-opened, but it was still not safe for children. But how they were ok with it because they were getting old and had already lived their lives. Besides, someone has to take care of the animals. I wondered if there were any stores open in the area. Just one Lawson(a convenience store) and a couple of gas stations was her reply. They basically get their food from the Lawson, and sometimes on the weekends they get visits from relief workers. Sometimes they go to Koriyama, a city inland, to pick up supplies and stuff. My heart went out to them. In that moment, I understood the meaning of the fish that were given to me earlier that day. I told her to wait a moment, and I ran out to my car to fetch them. When was relieved to find that the fish were still cold. I brought them back to her, thanked her for her and her husbands’ help. Her face lit up and she ran it into the main house(away from the cats). We talked some more about different things. I remember her mention how a local farmer let his pigs go before he left town, and how she keeps food out for them. She mentioned how she didn’t want to come back to Namie but her husband had insisted. I thought about how strong and brave she was. I felt blessed to have had an encounter with such wonderful people. Truly the most remarkable among us can be found in the strangest places. It wasn’t long after that when the dogs outside started barking. Her husband had come home, and he had brought a half tank of gas with him. I thanked him profusely and asked him how much it was. He said not to worry about it, but to make sure I fill up at the first gas station I see. Made me feel a little guilty. But I told him about the fish and thanked him again. I asked his name, he says it’s Akama. We waved goodbye as I left, and I hit the freeway back to Sendai. As I’m leaving Fukushima, I contemplate what had occurred that day. I feel that somehow the Akamas were always meant to receive the fish. In all honesty, they would have been wasted on us. I had been chosen to be the delivery boy and was honored to play the part. The Akamas are wonderful people who helped me in my time of need. It’s a strange thing to put yourself at the mercy of someone else. The world tells us that people are selfish, and will take advantage of you in any way they can. People avoid relying on others as much as possible for that reason. My dad told me once that he believes the Kindom of Heaven is here, now. It is all around us and is ready to reveal itself to us as long as we open our hearts and minds to it. The generosity of the fisherman ends up a gift for a couple of kind souls taking care of stranded pets in a wasteland. Coincidence, maybe. But there is poetry in the way it all came together that is hard to ignore. A reminder how wonderful life can be when you live freely, not trying to control everything.